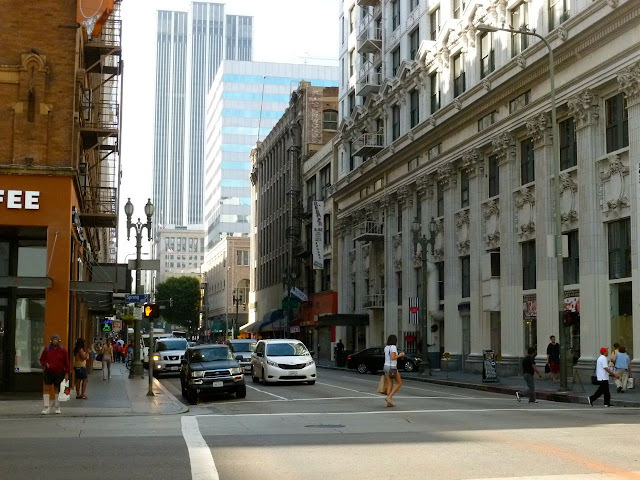 Two years ago, I was back in Los Angeles and had a bit of time to explore the Historic Downtown Core. Here's a link to Part I, Part II, Part III, Part IV of this multi part series. This week continues back along Spring Street in downtown Los Angeles. Above, the 14 story 1927 Financial Center Building, located on the corner of Spring & 7th Streets. Looking north (technically, northeast) up Spring Street. I crossed the street at the light - to walk along the east side (sunnier sider) of the street. 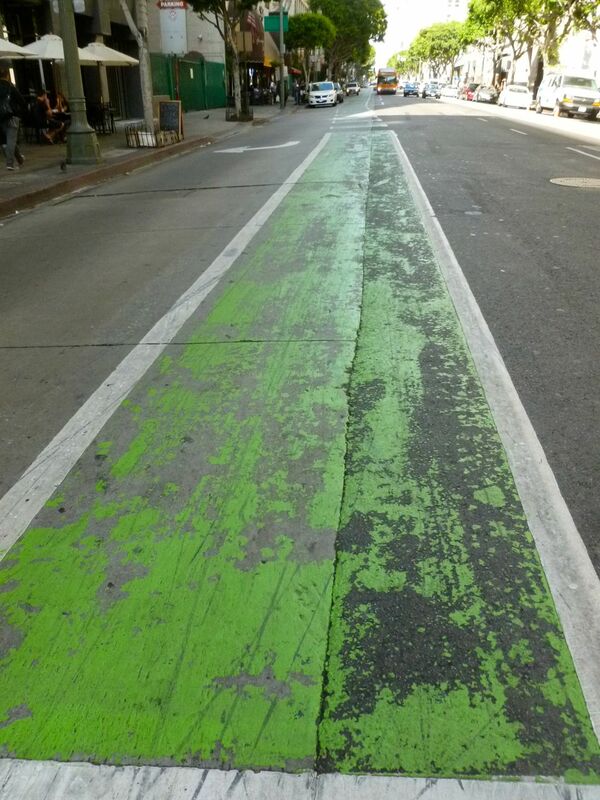 The bright green (and somewhat faded) of the bike lane on Spring. Apparently, the one group unhappy with is the local location scouts and studio executives. 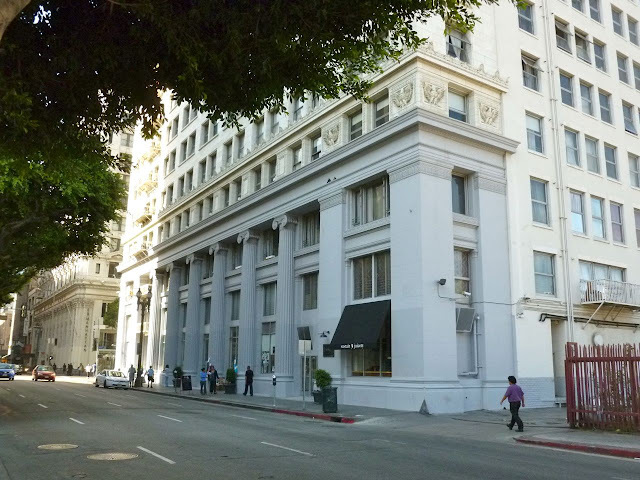 Spring Street's historic architecture often fills in for New York or other East Coast cities, both present day and historic. The bright green paint - faded or not - makes this much harder for Hollywood to make this happen. The 1921 Spring Tower Lofts - apparently, one of very first live/work lofts in Los Angeles. 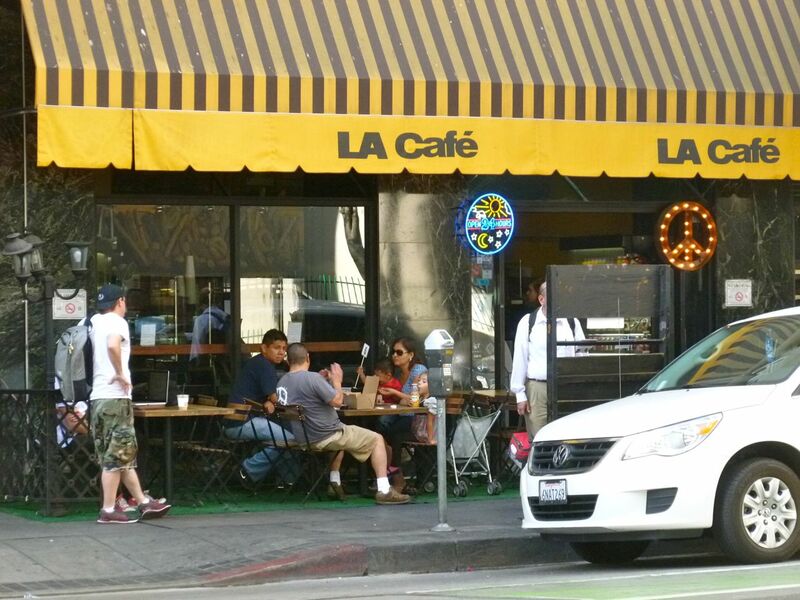 L.A. Cafe - featuring outdoor dining on the street. My assumption is that this was one of the very first restaurants in the historic core to include outdoor dining right on the street. Mural outside of Premier Towers - another residential tower. 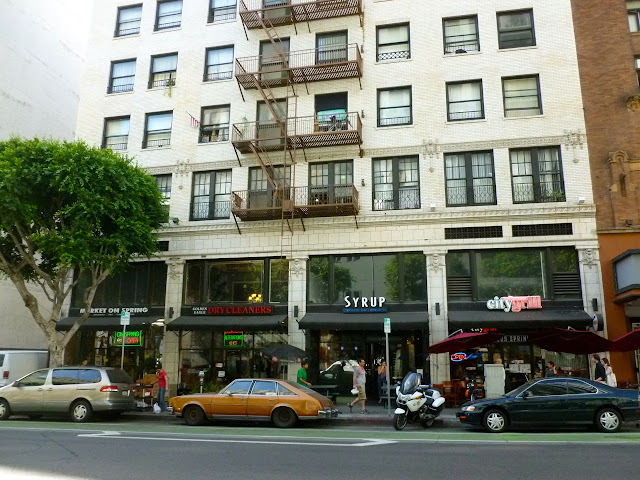 Another view of Spring Street Lofts, and L.A. Cafe. 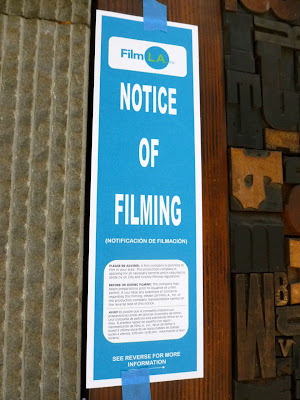 Remember what I said about Spring Street being a popular filming location? Really true. 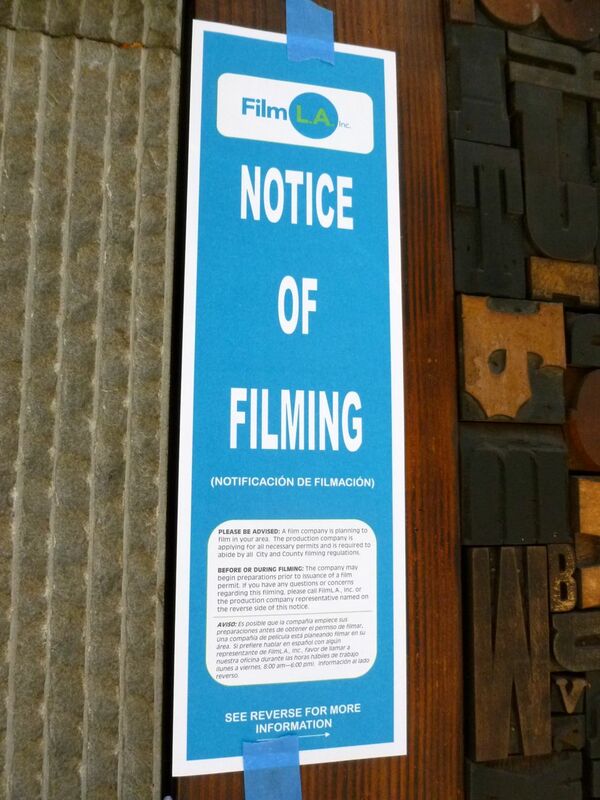 "Notice of Filming" - despite major tax breaks from other cities to lure filming away from Los Angeles, L.A. remains the center of the entertainment industry, with up to 100 different commercials, movies, and TV shows being filmed on L.A. city streets on a given day. 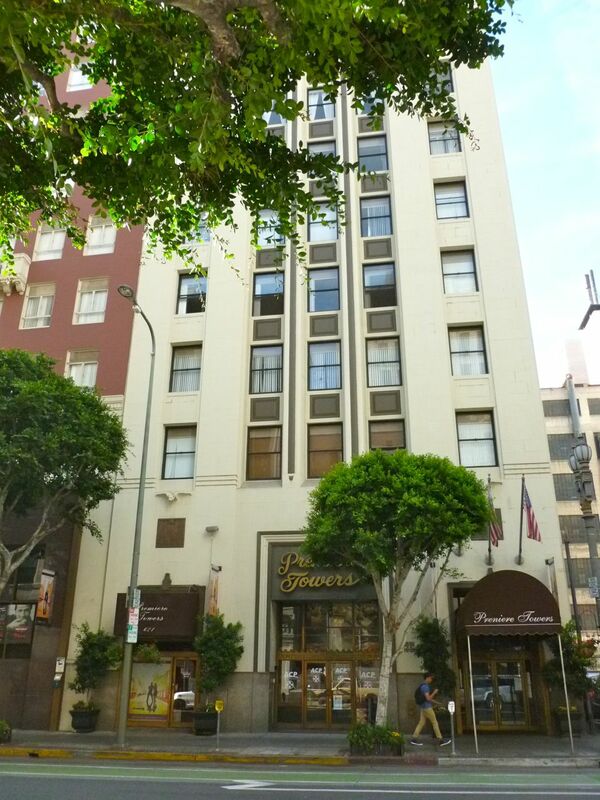 Premier Towers - consisting of two 1920's era buildings that are now one apartment building. Yes, looks like something straight out of Manhattan. 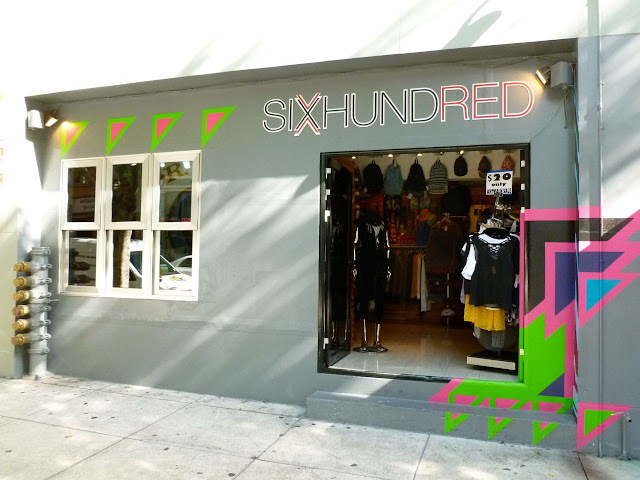 Six Hundred - a women's clothing store - is located at 600 S. Spring Street. Easy enough. I love the the completely open door. This was November. Similar "open door" weather can be found in June as well. 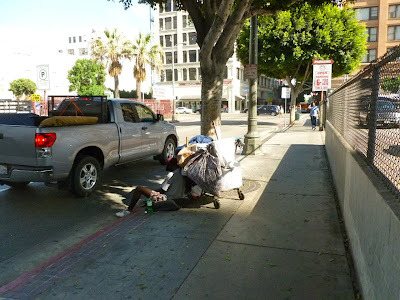 Of course, there's no doubt a time when the front doors need to be shut - winter days can be cold, late summer can be hot - but with it's Mediterranean Climate, Los Angeles (along with the rest of Southern California) has some of the best weather in the world. It's awesome how Six Hundred has fully taken advantage of this. Walking around downtown, it seems like it's only a matter of time until similar retail will eventually begin to take hold one block west along Broadway. 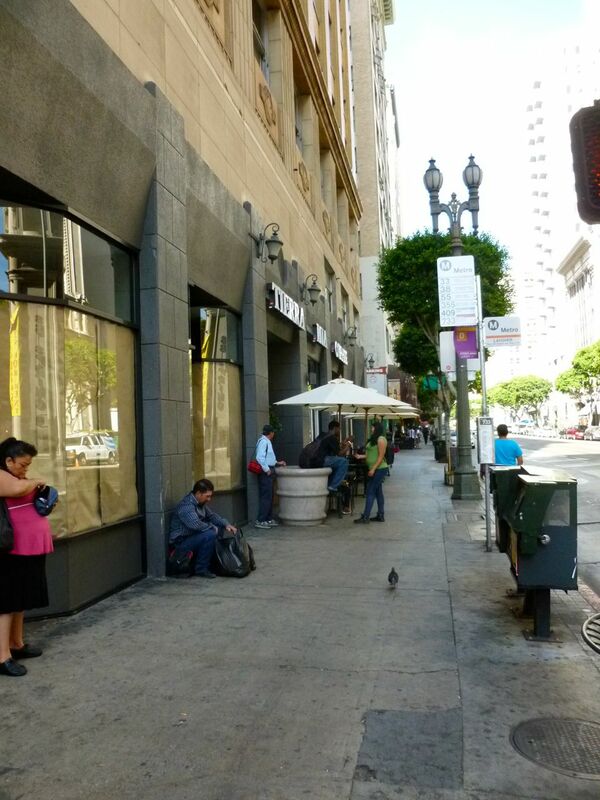 Across the street: Market on Spring, Dry Cleaning, Syrup Expresso Bar, and City Grill. Spring Street - especially between 6th and 7th Streets - seems like ground zero for the gentrification occurring in the Historic Downtown Core. 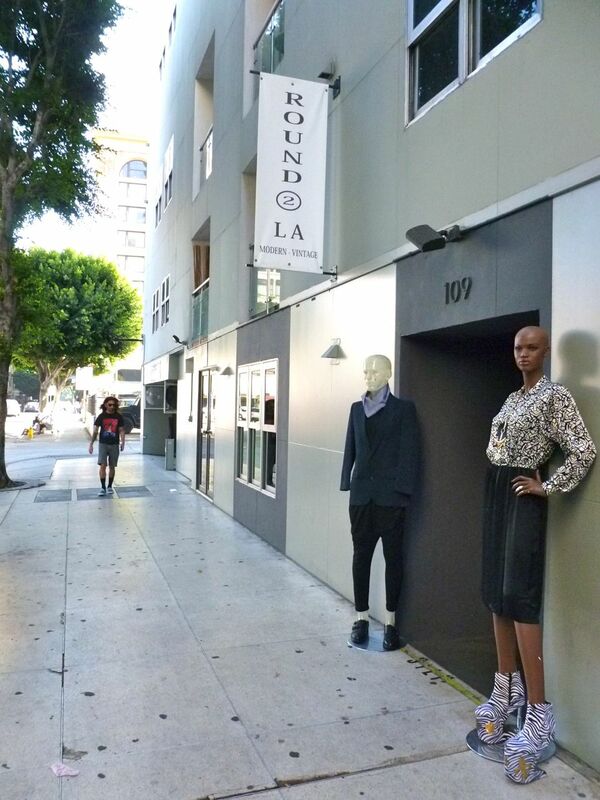 "Now [in downtown Los Angeles] we are getting shopping options. In the very beginning it was bargain shopping. Now we are seeing some higher end. That is great. What I think is going to be key is making sure that it's both eclectic retail and that it appeals to all income levels. I am not interested in created a yuppie town." 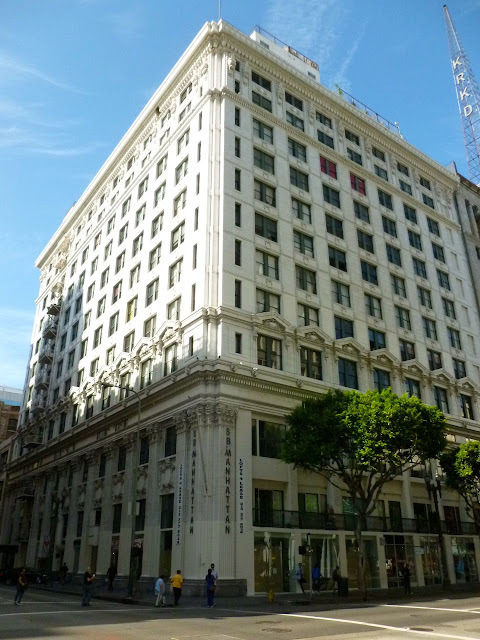 The Los Angeles Times article (which was published a few days after I posted this) focuses on the major changes in downtown Los Angeles, citing both the Staples Center and the 1999 adaptive-reuse ordinance that made it easier to renovate old office buildings into housing as the two most important reasons for these changes. The entire article can be found here. Outdoor dining near the corner of Spring and 6th Streets. Before turning the corner, looking back down Spring Street. 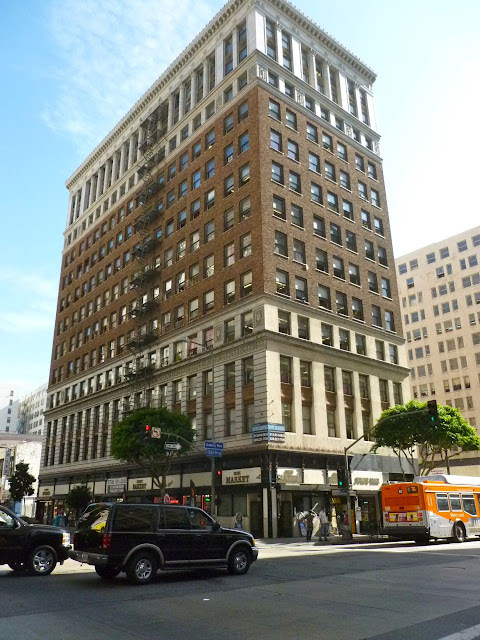 North corner of Spring and 6th - the 11 story 1910 Pacific Southwest Bank Building. 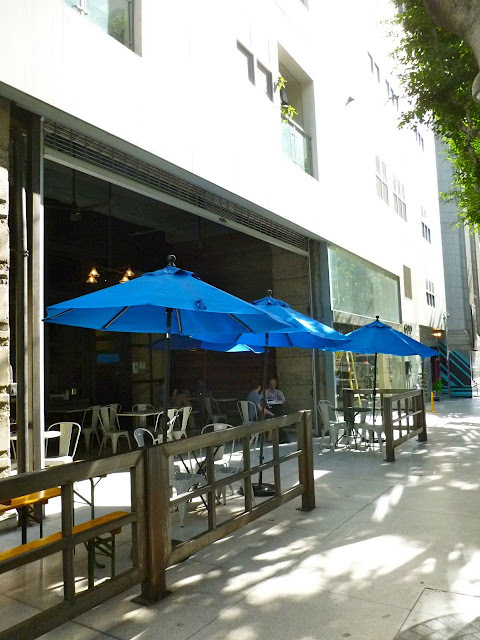 Street level retail includes Springtime in New York Cafe. 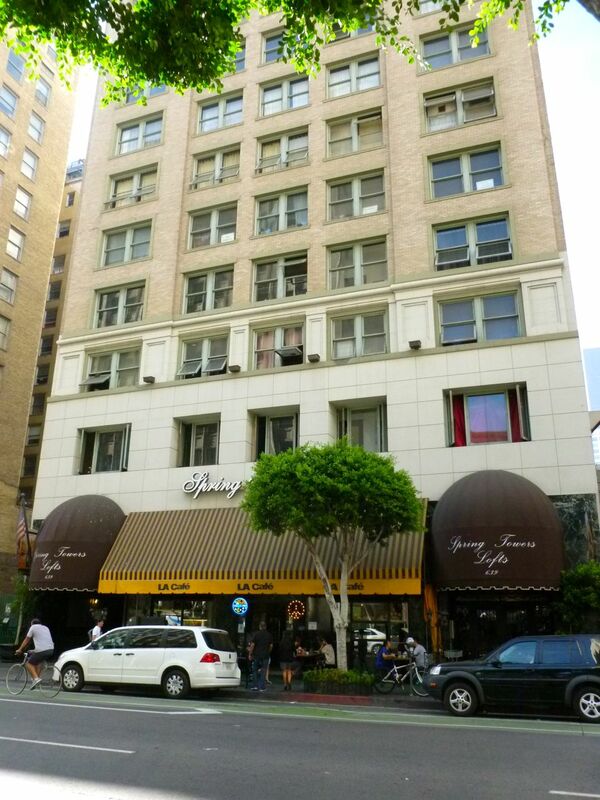 The upper floors are now SB Manhattan Lofts. Looking west up 6th Street - on the left, you can just catch the EE of the Starbucks Coffee on the corner. 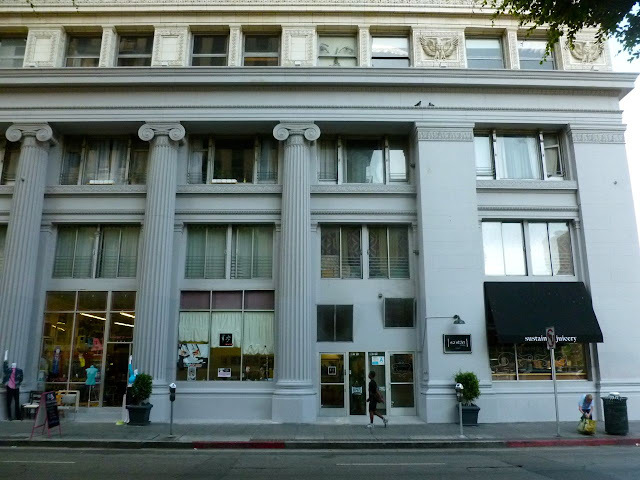 On the right is a street level view of the Pacific Southwest Bank Building. As a Christian, I posed this question a couple of months ago and think it's worth asking again: what makes a great city? What elements, what public policy, what sort of planning, zoning, and design elements provide for a great city? And create the greatest human flourishing in an urban environment? How are neighborhoods laid out? Roads, parking, public transportation? How does this affect the poor or economically marginalized - as well as the general populace? What can we learn from other places -- and from history? How does a Christian world-view affect this, if at all? Most of the building in the Historic Core were built in the 1910's and 1920's. 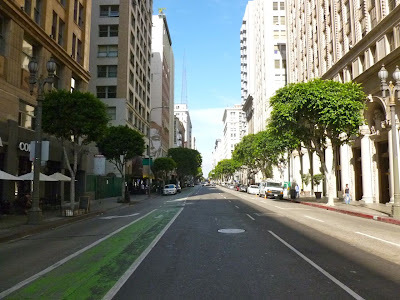 Are there any design elements from the buildings or even the zoning that could be applied elsewhere in the city - even in such a car centric city as Los Angeles? 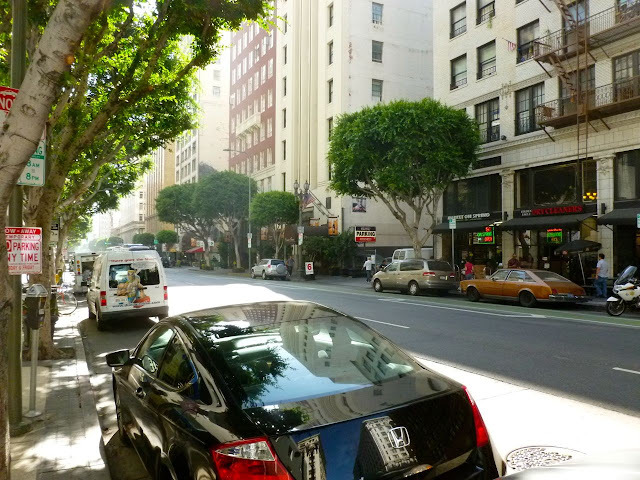 I would have love to have spent more time exploring Spring Street, but I parked at a meter and was running out of time. 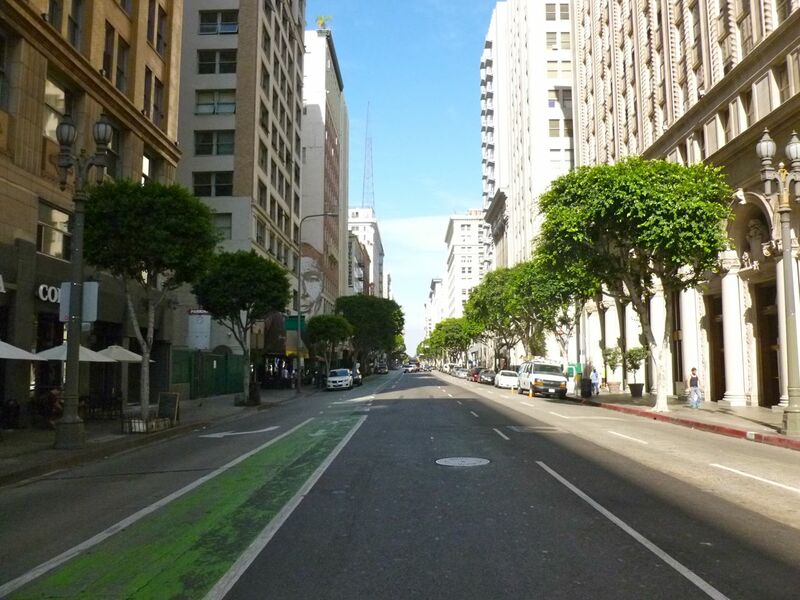 I turned the corner and headed east on 6th Street. Here's more commercial - coming right out to the street. In that sense, it reminds me of the retail along Broadway - but catering to a very different clientele. Round 2 Los Angeles - got a lot of good reviews on Yelp. Once again, retail right out to the street. Across the street is the 12 story 1913 Lloyd's Bank Building. located on the corner of Spring and 6th Streets. 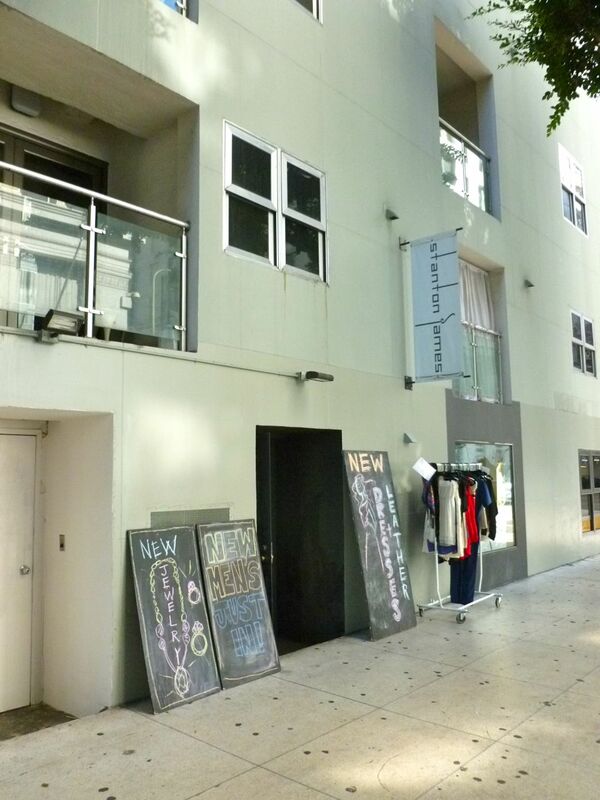 Retail at street level. 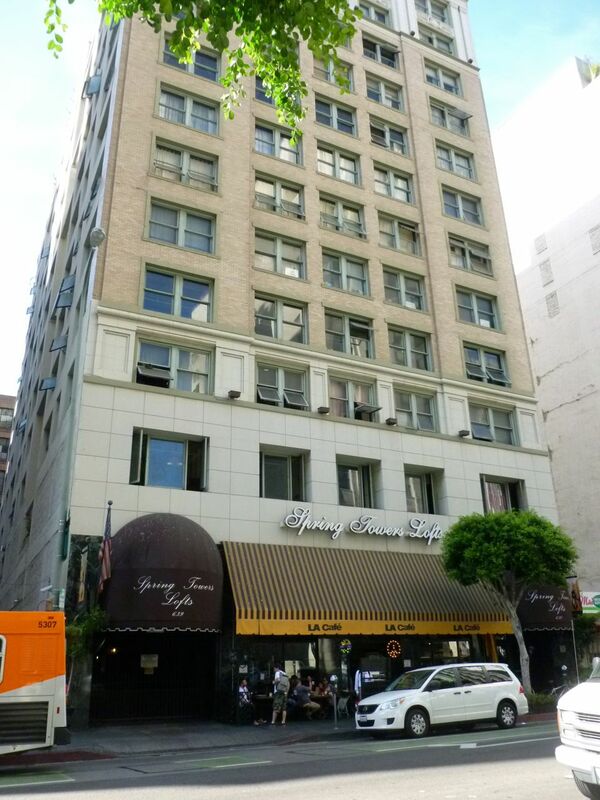 The building has been renamed as SB Lofts Building, with 1-3 bedroom rental units (on-line reviews aren't too positive). Backside of the building on the corner of Spring and 6th Streets. I was pleasantly surprised how clean this Downtown L.A. alley was. 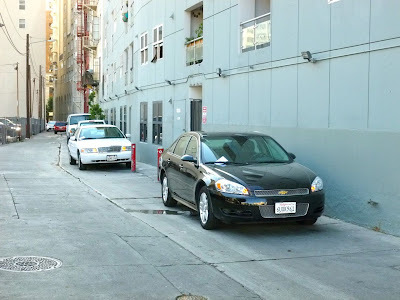 Apparently, according to google maps, this two block alleyway is called Harlem Place. Looking east (technically, southeast) on 6th Street. The shopping cart of belongings was the first real reminder that Los Angeles' skid row was just a three blocks away. In fact, the reason I was downtown was because I wanted to visit the Union Rescue Mission. A final view of the Lloyd's Bank Building. 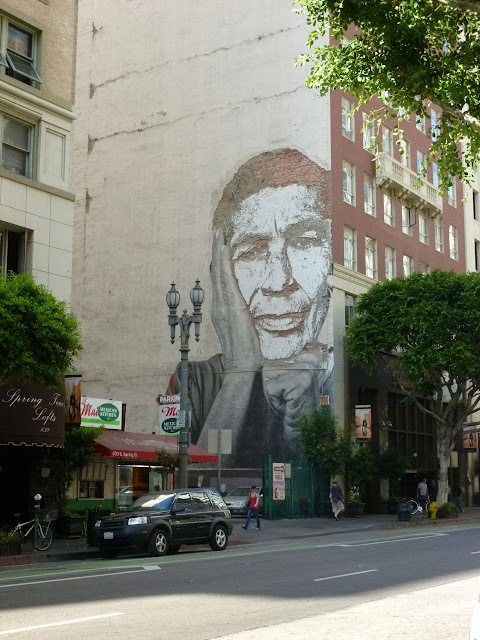 More next time in Part VI of our multi-part series on the Historic Downtown Core.